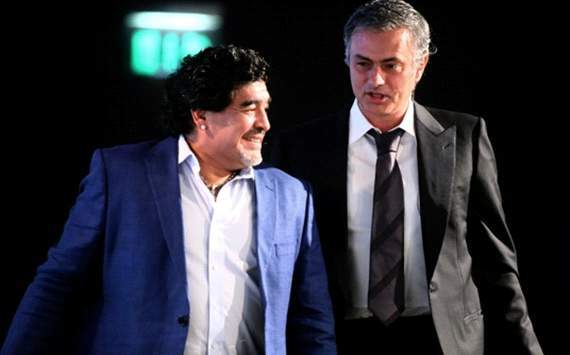 Diego Maradona says he believes that Real Madrid’s Jose Mourinho is one of the world’s top coaches. The Portuguese guided the Blancos to the Liga title last season, and has also won the top-flight league trophy in Portugal, England and Italy, alongside two Champions League successes. Maradona, whose coaching career has not been anywhere near as glittering as his playing days were, believes that the former Inter boss’ attention to every member of the squad has helped him thrive at the top. “The results he has achieved speak volumes for his ability,” he told reporters at a sports conference in Dubai on Friday, where Mourinho was also speaking. “I’ve seen him coaching and he’s top. He devotes a lot of attention to all the players on the team, from first to last. “I was a player who wanted to be known, but it’s a fine thing when a coach isn’t only concerned with you, but also with your team-mates, because they are the ones who help you on the pitch. Maradona is currently on a coaching hiatus, having left his former club Al Wasl earlier in 2012. His most notable position to date was coaching his native Argentina at the 2010 World Cup, where the South American side were knocked out by Germany in the quarter-finals.